Posted: December 30, 2015 11:10 p.m. 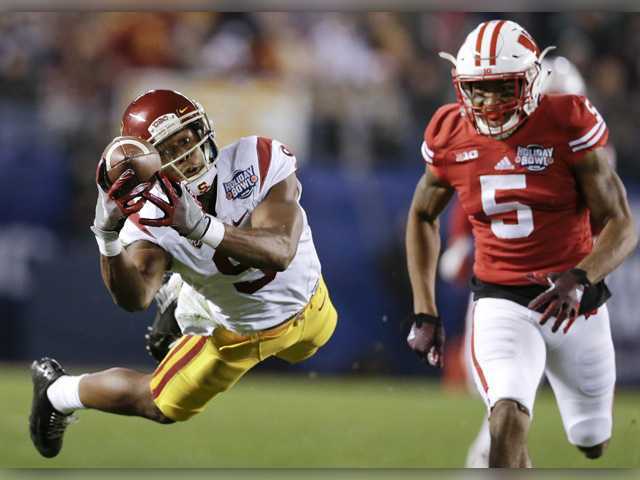 Updated: December 30, 2015 11:10 p.m.
USC wide receiver JuJu Smith-Schuster (9) drops a pass as Wisconsin cornerback Darius Hillary (5) defends during the Holiday Bowl Wednesday in San Diego. USC lost 23-21. SAN DIEGO (AP) — Rafael Gaglianone kicked a 29-yard field goal with 2:27 left to lift No. 23 Wisconsin to a 23-21 victory against Southern California in the Holiday Bowl on Wednesday night. Gaglianone's third field goal gave Wisconsin (10-3) its first win in seven tries against USC (8-6). The teams hadn't met since 1966, and two of USC's wins in the series were in the Rose Bowl, in 1953 and 1963. Wisconsin's Sojourn Shelton intercepted Cody Kessler with 1:44 left. Kessler was hit from behind by Jack Cichy. USC, which beat Nebraska in last year's Holiday Bowl, had taken a 21-20 lead on Kessler's 7-yard touchdown pass to Darreus Rogers with 10:19 left.